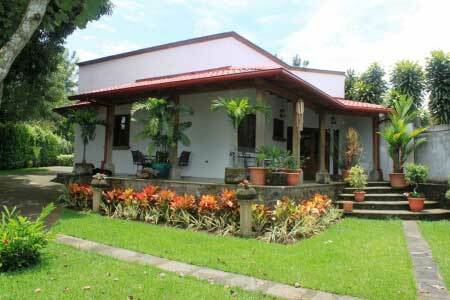 This beautiful Spanish Colonial home is located in Tambor de Alajuela, only 15 minutes from the airport and 10 minutes from downtown Alajuela. Built in 2000 on 1/3 acre, it is complimented by manicured lawns, shrubs and trees. The main wing of the house features a large formal dining room and a large formal living room with a stone fireplace with each containing gorgeous verde gris iron chandeliers. In addition to the separate TV room is the kitchen with stainless steel appliances, recessed lighting and ceramic tile counters with curved carved wood edging. The huge master suite offers rare hardwood flooring, a walk-in closet, large bathroom with dbl sinks, Jacuzzi and separate shower. There are two more bedrooms on this wing, a full bathroom and a powder room bathroom off the TV room. The master bedroom opens out to an oversized spectacular terrace overlooking the front garden. The 3 bedroom suite over the giant two-car garage has wooden flooring, a full bathroom, and a balcony looking to the west. This suite could easily be converted into a fully separate apartment. The laundry area is enclosed with a small patio/garden. The garage is beautifully tiled and has a secured storage room. In the rear of the property is a large rancho with an open area for entertaining, a full bathroom and a large room currently used for storage. Beyond the rancho is a stable with room for one horse. All garden areas are watered by an electric irrigation system during the dry season from a creek at the rear of the property. The property street-front has a beautiful electric entry gate and a stone wall with imitation clay roof and landscaping making it the prettiest property in Tambor. This home has beautiful architectural design with imported Spanish ceramic tile, hardwood ceilings, cathedral ceilings in the formal dining and living rooms, hardwood floors in all bedrooms, beautifully and amazingly hand tooled wood craftsmanship on window frames and outdoor beams and columns, and much, much more. An ideal home for entertaining guests. This property could also be made into a bed and breakfast with little or no modifications.